Hitler was a megalomaniacal artist intent on remaking the world, not only through murder on an unprecedented scale, but by destroying the ethical relationship between words and truth and images and reality. The Holocaust and Holocaust Denial were twins born in the same monstrous womb. In the twenty-first century, can we possibly recapture the Renaissance ideal that “the eye is the window of the soul”? How can we reconnect words and images to deconstruct Orwellian lies, numbing kitsch and totalitarian faux-art? Using Tadeusz Borowski’s This Way for the Gas, Ladies and Gentlemen as a proof text, Venus febriculosa has challenged some of today’s finest artists to reconceptualize the book cover as a way to reconnect words and images as a pathway to a human but horrifying truth. This Way for the Gas provides an interesting trigger for analysis and discussion on what might not be a new quest, but a challenge radically changed in the post-Holocaust era. In Auschwitz, the concentration camp that was Hitler’s factory of death, the murdering of several thousand people each day had to be extremely well organized. The Germans chose young men from among the prisoners for various office chores, especially couriers. Their lives were prolonged for the moment, but they never knew for how long. For that honesty and truthfulness he paid with his life. Caught in the web of propaganda and put in the position of having to write lies about the communist future of Poland, he preferred to commit suicide. Venus febriculosa is thrilled to announce its first book! Edited by Marco Sonzogni and with contributions from Alicia Nitecki, Berel Lang, Simone Gigliotti, John Bertram (that’s me! 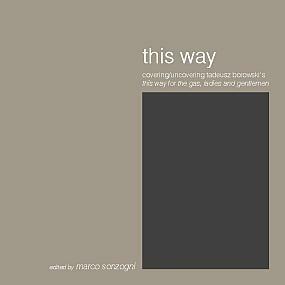 ), Dov Bing, Monica Tempian, and Giacomo Lichtner This Way is began with our Book Cover Contest #4. For more information visit This Way Project. You can see some sample pages from the book here. Available now from Dunmore Publishing, Ltd. Order here!